There hasn't been many books on this war. The fact that it was one of the largest wars of the 20th century seems to have been forgotten. The large forces involved, and the very large casualty list, shows it to be a war that deserves more space on shelves. We in the west view it as a small war fought over small pieces of boundary territory between Iran and Iraq, not the titanic struggle it really was. When Saddam Hussein launched this war, the political situation was much different than when he invaded Kuwait in 1991. A decisive Iraqi defeat of Iran would have caused a huge change in the balance of power in the Middle East. When the war was launched, most in the west did not have the mental image of Saddam Hussein the way he was subsequently viewed. In fact, as the book shows, he was able to buy a large amount of military weapons from the west. As far as the U.S. was concerned, Iran was enemy number one. The first volume starts with the stats and background behind the war itself. It was fought between 1980-1988, and is the longest uninterrupted conventional conflict of the 20th century. The western studies of the casualties put the amounts much higher than the Iranian official ones, and there is no official Iraqi list. It is very possible that the combined figure was close to 3,000,000 casualties, with more than 500,000 dead. Most of the war resembled WWI fought with modern weaponry. 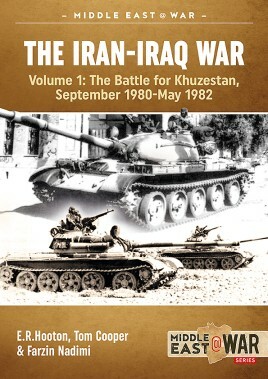 The first volume encompasses September 1980 to May 1982 and the battle for Khuzestan. 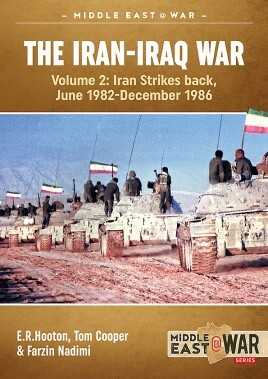 The book goes on to show the bad blood between Iran and Iraq long before the war. The Shah of Iran spent a lot of his country's wealth in the 1970s buying western arms. Between 1974-1975 there was a war inside Iraq between the Kurds and the government forces. The Shah supported the Kurds in their insurrection. The border of the two countries was always a source of contention. It was set after the end of WWI by the Allies. After the Shah was deposed in 1979, and the subsequent chaos in Iran, Saddam envisioned a quick and easy war against a prostrate Iran. The stage was set with Iran having a large amount of western weaponry, but no way to get replacement parts. The Iraqi armory was equipped with a hodgepodge of Soviet and western equipment. The authors go onto show that Khuzestan was the home of most of the Iranian refineries, and therefore its wealth. Saddam quickly found out after the invasion that he had grabbed a tiger by the tail, and dared not let go. His dreams of easy victory evaporated over the desert sands. Next, we see the Iranians attempt to not only stop the invasion and reconquer their land, but also to crush Iraq and depose Saddam. As the book notes, U.S. intelligence stated "Iraq was fighting a limited war, while Iran was fighting a total one". The religious differences between Shia and Sunni only helped to pour fuel on the flames. Per the book: "The Iranian tactics bewildered even the best Iraqi officers" who were used to battle being a set piece affair. The swarming tactics of the Iranians left the Iraqis unable to cope. The Iranians were better able to deal with their casualties than the Iraqis. Iran as a political entity had existed for a few hundred years. The stitched together Iraqi nation was built at the end of WWI by the Allies. We are still seeing the folly of some of their decisions today. Volume 2 starts with a recap of the first two years of the war. The initial Iraqi invasion of Iran followed by the Iranian offensives is touched upon. The book then goes into the infighting at the government level in Iran, and whether to stop at the original border or to risk more international censure and actually invade Iraq. The decision was made to invade and attempt to topple Saddam. Iran was also hoping for a Shia revolt in Iraq, that never took place. This volume then continues to describe the seesaw battles that took place from June 1982-December 1986. The books themselves are large, and eighty pages long. They are full of pictures of the war, and also have a good amount of large colored side views of the of the different planes, armor, and other vehicles. These are excellent for model makers. The military and political history of the war is fascinating, and the books' writing only serves to make it that much better. These volumes are another score for Helion&Company. Volumes 3 and 4 are scheduled to be released in September of 2017.